I hope that, those of you who went down for the celebrations for Corpus Christi, really enjoyed the occasion. Looking at the photographs on Facebook posted by the church, the people of the town made it really special for the children. The carpet in the town square seems to get larger every year. This time there was no greenery, just flower petals that were hand picked from thousands of carnations and other flowers. It was obviously a massive undertaking that was completed in good time. It wasn't just the town square that received attention. Along the route there was a further carpet that was laid out in the street and many other points where altars or tributes had been created with loving care. The children who had received their first communion looked beautiful in their special clothes and of course the children in pages outfits that performed a dance routine at the front of the church. Pamela and I were very sorry to miss it, a mistake we will try and avoid in future. Instead, we are here in Merry England with our family where we have just spent three wonderful days at Center Parcs, Sherwood Forest. Plenty of walking, swimming and taking part in various activities. It was a great deal of fun and time with the family is always invaluable. Today, I need to relax though and recharge my batteries. Many things we didn't know. We don't just learn Spanish from our teacher, we also learn a lot about Spain and life in Bigastro in particular. Last night, we met up with Antonio and walked along Calle Purisima. On the way we stopped at several places where he explained how things used to be. For example, we learnt that Calle Purisima was mostly lined with single storey dwellings in the past and the road was simply compacted soil - no tarmac! Further on, we stopped at a vacant plot where Antonio told us a cinema once stood. In fact, there were two cinemas on the site; one for winter and one for summer. The summer one was open air with its own screen. Antonio went on to tell us that, in fact, there used to be another cinema in Bigastro located elsewhere. At that time, nobody had televisions in the town, the sole entertainment was either the radio or a trip to the cinema. We explained that it was much the same in England during the 50s. Pamela and I both recall that our first television sets were bought specially to watch the coronation of Queen Elizabeth II. Because we were the only people in the streets where we lived to have televisions, the neighbours all came round to watch the ceremony unfold. On a screen no larger than 14 inches and most probably only 12, you had to be close to the set to see any sort of detail. In the last few years, Bigastro has upped the game for this important religious celebration. The whole town now joins in to decorate the main square and the route that the procession will take. Centrepiece will be the carpet outside the church in the town square. In the centre of the floral carpet will be a picture which depicts the "Year of Passion". The picture is being made up with thousands of grains of rice which have been dyed to create the colours needed. Those tiny grains are carefully placed on pieces of cardboard that have been coated with glue. The process takes hours, days even weeks of effort by people from the town who have dedicated tasks. Some work during the daytime on parts of the display, others start at about 10pm and continue until half past midnight. It is a vast amount of effort for just one day. You can find my album which shows some of the preparations going ahead in the sidebar. Those of you who go down to the town on Sunday will see the results of all this labour - trust me - it will be worth your time. My suggestion is that you go down when the preparations are finished at about 5pm. Take a tour from Puerta Alvaro up to Calle San Joaquin, continue along Calle Barrio Nuevo then down Calle Padre Damian to Calle Aureliano Diaz which becomes Calle Purisima. 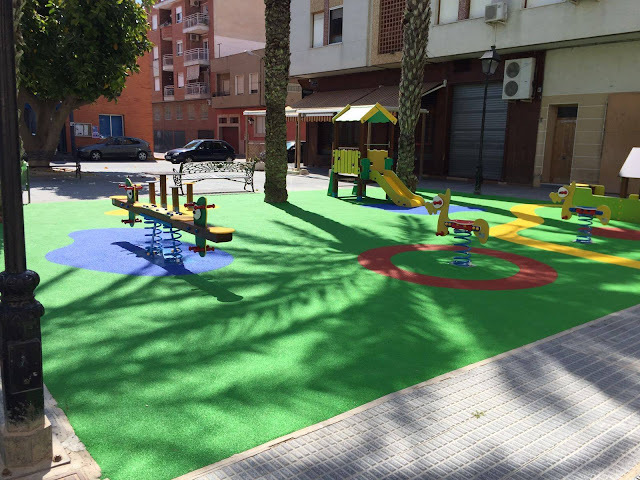 Follow that back to the Plaza de la Constitución to see the decorations in the main town square and the carpet laid out in front of the church. En route you will find many points of interest where individuals have made their own contributions to the route. You can then go down at (I think) 7pm for the special mass followed by the procession along the route I have suggested. You will likely be delighted by the children dressed for communion, the girls in long dresses of cream or white and the boys in their sailor suits. 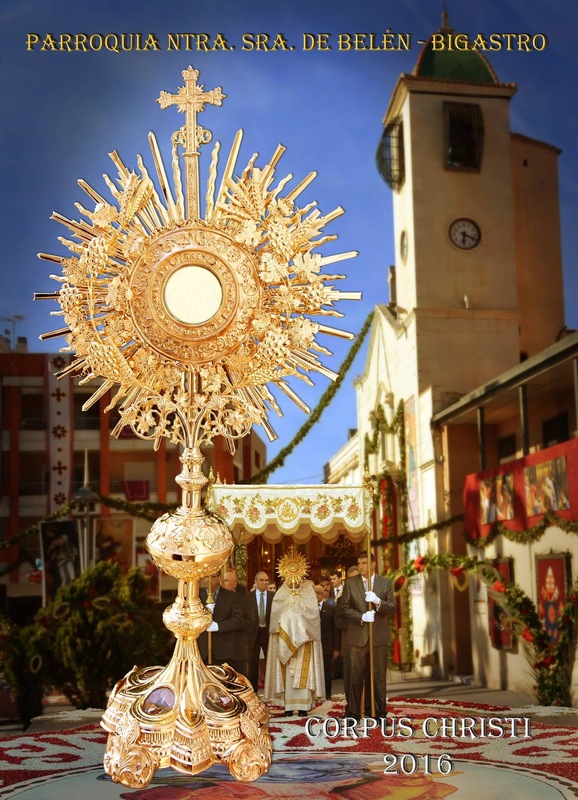 NB Corpus Christi is actually this Thursday and many cities and towns throughout Spain will hold their celebrations on the day. In Bigastro, we wait until Sunday to allow maximum participation. 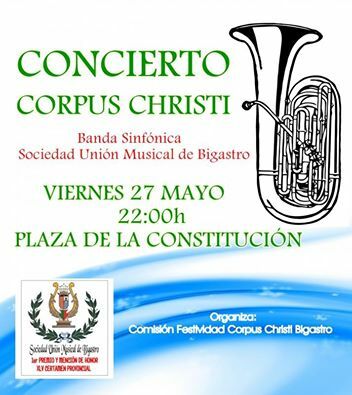 I hope that you all enjoy the concert on Friday. Sadly, Pam and I will be away and therefore miss it. Sadly, we will also miss the procession for Corpus and so no photos or video this year. Fortunately, there are many great photographers in the town who will provide pictures at least as good as mine and probably better. I have apologised profusely to the priest who tells me that he very much likes and appreciates my work. 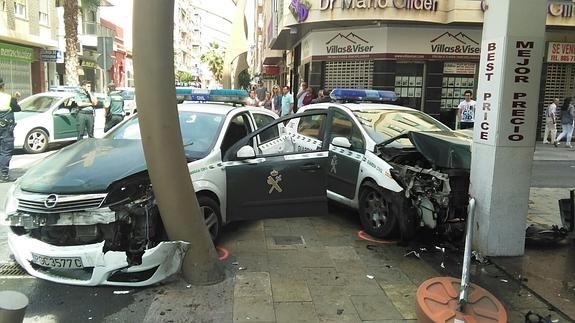 When officers of the Guardia Civil spotted a car with someone they identified as a thief, they gave chase. In the process, two of the cars belonging to the police ended up on the pavement badly damaged. The officers were taken to Torrevieja hospital with minor injuries. The car they were chasing eventually came to a halt when it burst a tyre and the occupants were arrested. Pascual Segura recalls the story of an English lawyer, Richard Ford, who visited Spain in 1830. Following the river Segura, he passed through the orchard of Bigastro destined for Orihuela. On his way he wrote in his notebook: "the Segura river fertilizes one of the richest plains in the world. Rain or shine, wheat grows in Orihuela. " Almost 200 years later and the garden of Bigastro continues to arouse as much admiration as it did for that English visitor. 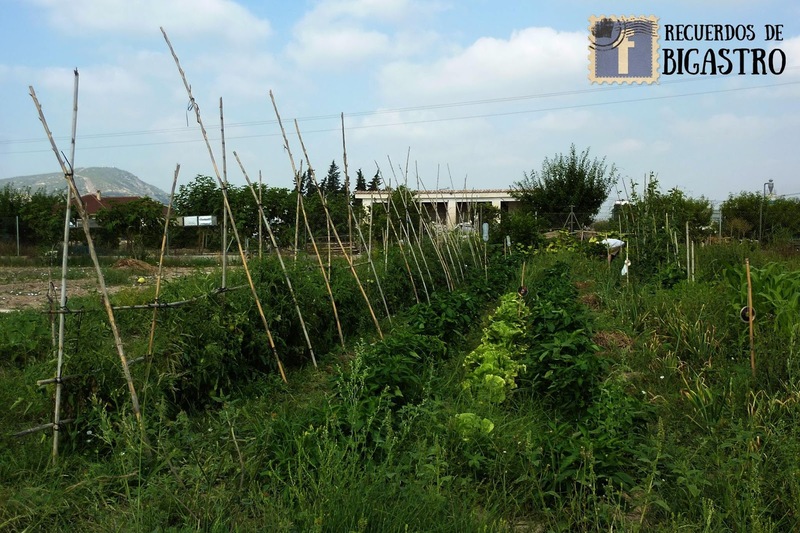 Well Pascual, we too are English and, just like the man in your story, the way agriculturalists of this area are able to produce such wonderful crops in such adverse conditions amazes us. The abundance of sunshine is a plus but could easily be outweighed by the lack of rain. The ingenious ways that the farmers manage to channel water to their crops is remarkable. 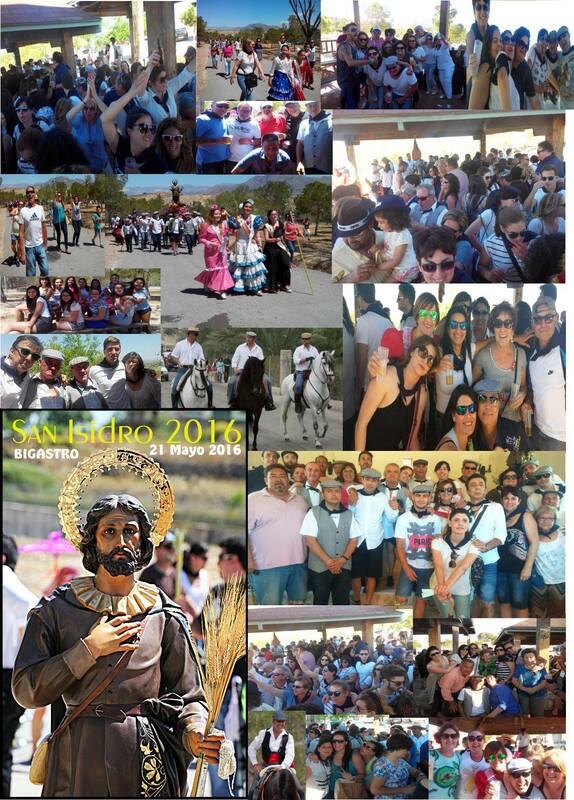 I'm not sure whether brilliant sunshine is an asset or otherwise for the traditional Romeria of San Isidro. Following mass in the church, the pilgrims set off from the town square en route to the Hermitage at La Pedrera. From the crossroad between Avenida Europa and Calle Canada de Andrea it is a steady climb to the bottom of our estate. However, from there the road ramps up as the pilgrims follow Calle Le Vigan to the junction with Calle Irlanda. Then it flattens out a little but steepens again as they turn up towards the recreation area and the Hermitage. As per every year, there was a mixture of young and old taking part with some pushing push chairs with young children onboard and of course there were the men who carry the burden of the statue. Leading the way was a group of four horsemen and just behind the statue was a charanga (ad hoc band of musicians). Quite how they manage to play an instrument whilst negotiating a steep road is beyond me. I only know that I have to stop several times to catch my breath when I follow their route. This year, a train from Crevillente was put into service to carry those who wanted to take part but did not want to tackle the walk. We could hear the train going backwards and forwards all day ferrying people back down to the village. You can see my album of pictures of the pilgrims on their way by going to the sidebar. 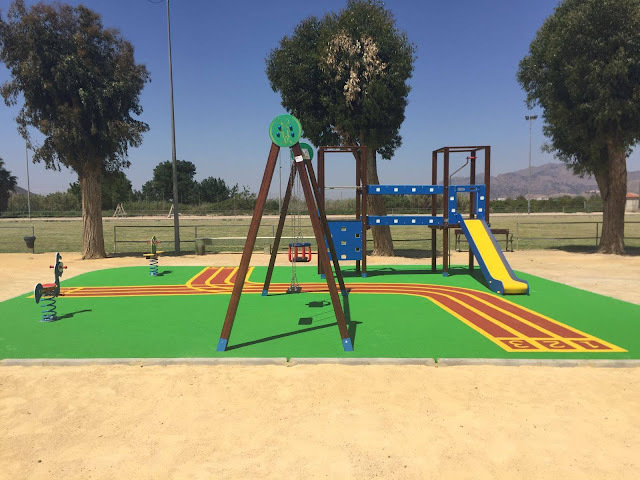 Work is now finished to transform the childrens' playgrounds at the Plaza de la Concordia, Parque Santa Ana, Polideportivo Municipal and Villas Andrea. Excellent work, now all we need to do is to keep them clean and tidy - that means no litter and definitely no dog crap!! PS Spraying the surrounding area to the playground at Villas Andrea with weed killer would certainly help a lot. Cutting the weeds down rather than killing them off allows them to regrow. Between 2010 and 2012, the price of lemons plummeted down to 30 cents per kilo. At that price it was hardly worth farmers picking them and so many were left to rot on the ground. Farmers therefore dug up their trees and planted more profitable crops instead. As a consequence, there are 40% less lemon trees growing in the Vega Baja these days. A dwindling supply coupled with the problems of weather in other lemon growing regions means that the price of lemons has soared. Last year, farmers could expect 50 cents per kilo for Verna lemons. This year, the price has risen to 1.22 Euros per kilo. By the time these lemons hit the shops, the price will have jumped to almost 1 Euro per lemon. Is it any wonder then that we are seeing so many new plantations of lemon trees. Of course, there is the danger that the quantity of lemons grown will again rise to levels where the price drops back to those of 2010/12 - especially if the other lemon growing areas have better weather in future years. The really big issue though is the supply of fresh water to irrigate the crops. Unlike e.g. almonds, lemons need watering throughout much of the year and therein lies the problem. There is simply not enough water in this part of Spain and so farmers rely upon a transfer of water from rivers in the wettest parts of the country to the Segura - from the Ebro to the Tajo and from the Tajo to the Segura. Even though there is a huge surplus of fresh water in the Ebro that flows out to sea, it is the political divisions between the autonomous regions that prevents it from being transferred. The solution to the problem was to build desalination plants like the one at Torrevieja. However, the desalination process requires vast quantities of electrical energy which is of course expensive and that makes the cost of the water produced prohibitive. Farmers would prefer to pay the price of transferred water and only supplement that, when necessary, with desalinated water. When we moved to Spain, we wanted a garden of sorts and so the small area of land to the south of our house was left as soil. I have automatic systems that water the plants on the roof terrace, the pots on the north side and the garden to the south every day. In the summer, we add to that with the water needed to top up the pool. I dare say that, without those areas of garden, and without the pool, my water bills would be drastically reduced. I dread to think of the cost if we had a garden area the size of the one we had in England with its carefully manicured lawns! For those under 30 years of age who qualified in 2013, 2014 or 2015 and are currently out of work. They are being offered three months of work for 500 Euros per month. The traditional Romeria for San Isidro will take place this Saturday. 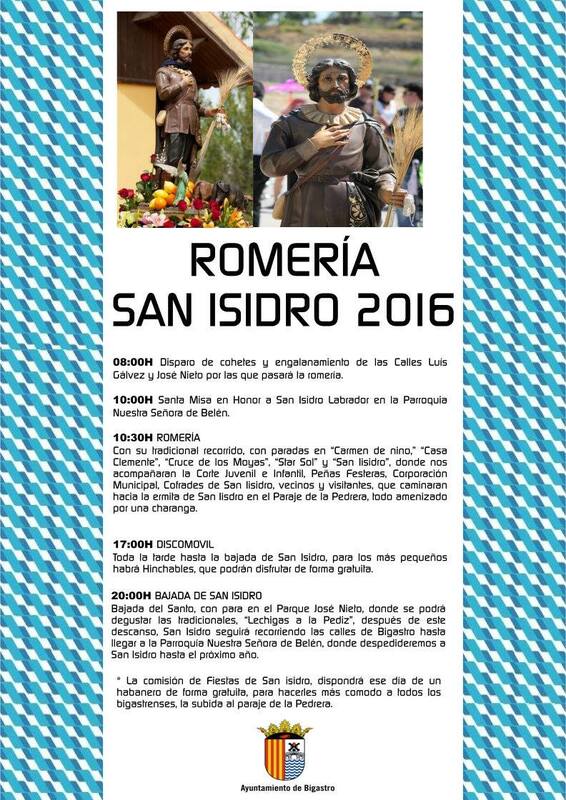 That means that hundreds of people from the town will accompany the statue of San Isidro (the labourer) from the church up to the hermitage at La Pedrera. 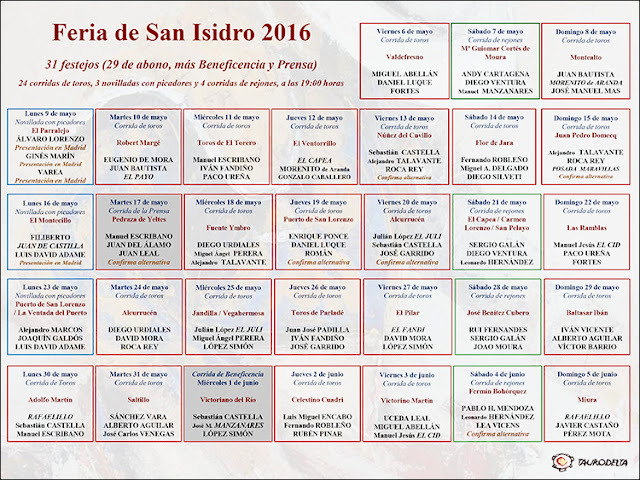 In the procession will be the Fiesta Queens, members of the Fiesta Comparsas, members of the Brotherhood of San Isidro and members of the council. There will likely be some horses taking part as well and possible a carriage or two. Along with the parade, many others will drive up to La Pedrera their cars laden with tables, chairs, gazebos, food and drink ready to enjoy a meal with family and friends in the sunshine. At 5pm a disco will be laid on for entertainment along with bouncy castles for the children. All in all, it should be a great day out for those who make the trip. In preparation for this, we normally have a group of workers who clean up the route by cutting out the weeds that grow between the kerbs and the roads. Although it would be better if they sprayed the weeds with herbicide first to kill them off, at least the roads look tidy for the summer. However, it is now Wednesday and we haven't seen sight of workers carrying out this task. I therefore wonder whether or not it is going to happen this year. Great photo (sadly not mine) and some excellent work with Photoshop to superimpose the image on top. So glad we didn't miss the concert last night at the Auditorium. The programme looked promising; the Corialan Overture by Beethoven followed by Haydn's Concert for Trumpet and Orchestra and finally the 5th Symphony by Beethoven. By way a of bonus they also played the jazz classic, Misty by Erroll Garner. The music was crisp, passionate and note perfect. Superb performances and lots of well deserved hugging between the conductor, the leader of the orchestra and the trumpet soloist. Something for our band to take note of - the musicians in the Elche Orchestra all sat upright on the edge of their seats. Some of the people who play in the Bigastro band slouch on their seats. It may or may not affect their performance, I can't say. I can say though that it doesn't look tidy and professional. You can see my album of photos located in the left hand sidebar. 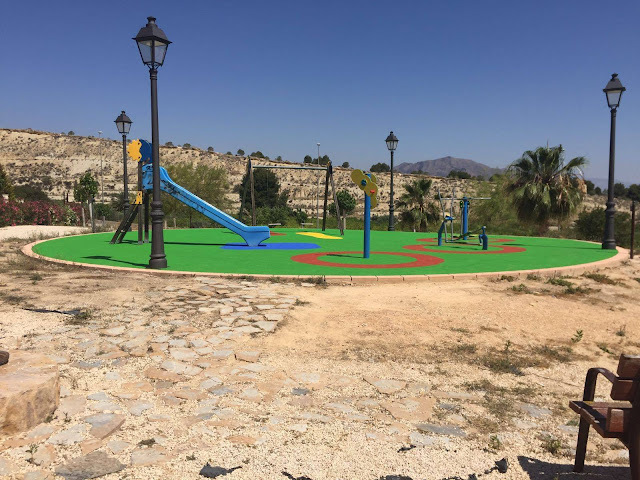 A great improvement from Spain. The UK may not have faired well in the Eurovision song contest but English became the chosen language for the majority of the songs. When the competition started in 1956, there were no restrictions on the language that contestants chose for their songs. In 1966, the rules were changed and everyone had to sing in their own language. A change of heart took place in 1973 which allowed the Swedish group, ABBA, to sing Waterloo in English. The rule was then reinstated between 1978 and 1998. This year, 21 out of the 26 entries were sang entirely in English. Out of the rest, only the Austrian entry was sang in anything but English and she chose to sing in French. Of course, the reason why so many chose English was to maximise their chances of winning. In the past, the competitors' English was often so poor that it was impossible to understand. Last night, all those who chose English seemed to me to be word perfect. Quite what those countless millions of viewers who have no understanding of English made of it though is hard to fathom. If you can't understand the lyrics, then a song is just a melody with a pleasant sound sang well. Eurovision became unfashionable and even a bit cheesy at one point. More recently though, the staging, the presentation and most important the music have improved tremendously. However, I still have fond memories of the time when Ireland hosted the competition and staged a performance of Riverdance in the interval. I can't remember any of the songs, nor the winner but I still recall being blown away by seeing Riverdance for the first time. PS Imagine how good it would have been if, instead of Justin Timberlake, the Swedes had managed to get ABBA back on stage to perform Waterloo! Now that would have been special. If you were thinking of going to the concert on Sunday but don't have tickets yet, you are out of luck. Pam and I were down at the Auditorium on Tuesday for our Spanish lesson but forgot to pick up tickets then. Pam called at the Auditorium when she was down in the town later in the week but it only opens in the afternoons so no luck. Yesterday afternoon I went down to try and get tickets but was told by the young lady there that none were left. Luckily, the President of the Band was outside and he happened to have two tickets in his shirt pocket which he kindly gave me. All of the concerts we have attended were performed by bands i.e. brass, woodwind, percussion with only a token string section. It will be a first to see and listen to an orchestra play and enjoy a night of Beethoven and Haydn. On Thursday morning, the Alicante Concert Band played at ADDA. Participating in the concert, were two bigastrense talents, members of the Musical Union of Bigastro - Joaquín Sáez and María Díaz -both winners of the First Prize in the 1st Category Group - Woodwinds - in the XVI Regional Contest for Musical Interpretation. 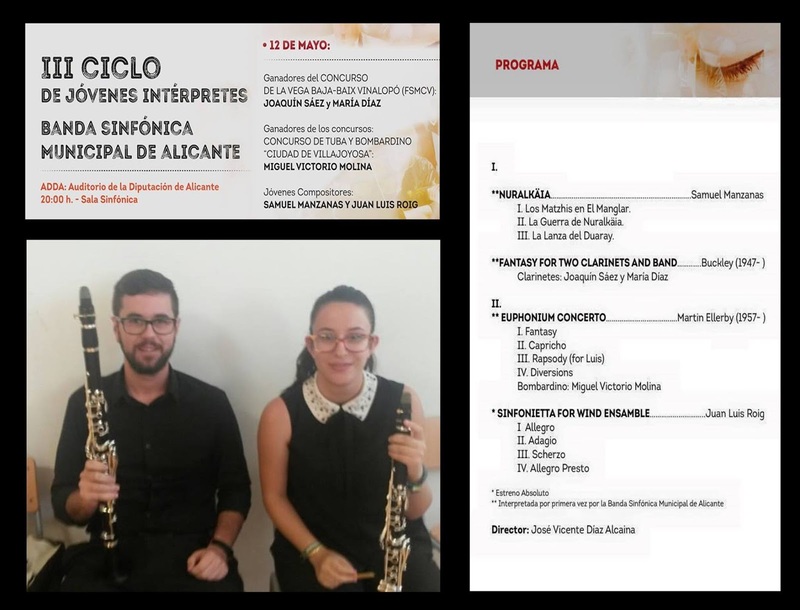 To add to the joy of the occasion, they were led by Maria's father and director of the Municipal Band of Alicante, José Vicente Diaz Alcaina. 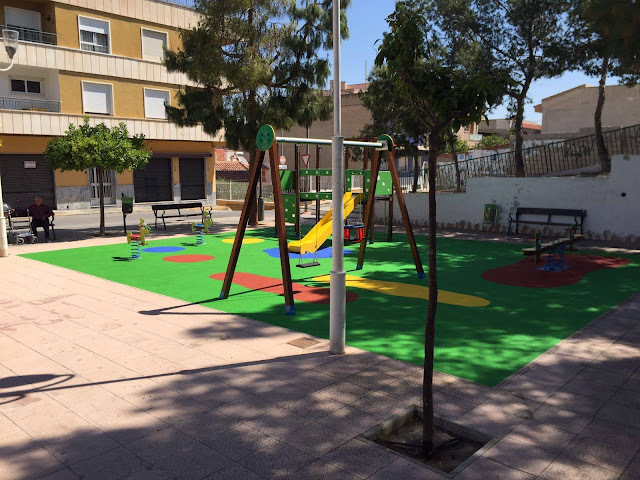 Angel Fenoll had the contract for garbage collection for Orihuela in 1992. Three years later, José Manuel Medina became mayor of the city and up until 2000, there was no competition for renewal of that contract. We now understand that Fenoll paid 7 million pesetas for that privilege. Five years later, there was a rift between Fenoll and Medina which meant a change of tack and so Fenoll favoured Monica Lorente instead. When the new contract was awarded to Urbaser, Fenoll claimed it was rigged. Lorente delayed the signing and so she became mayor in 2007 thanks to the support of Colsur (Fenoll's company). The PP allegedly provided Fenoll with the information needed to ensure his tender was successful, His companies then held the contract for waste management until 2012 and the election of Monserrate Guillen as mayor. The case, so named Brugal, has been complicated but at last, the Anticorruption Prosecutor, Pablo Romero is ready take it to court. He is asking for a 12 year prison sentence for José Manuel Medina (breach of trust, fraud and bribery) and eight years for Monica Lorente (fraud). These two were the mayors who managed the waste collection contract and were also responsible for the Zonal Waste Plan for the Vega Baja which involved many of the municipalities (not including Bigastro). Romero is also asking for a 37 years prison sentence for Angel Fenoll (breach of trust, fraud, bribery, influence peddling, extortion, coercion, conspiracy, insider trading and electoral crime). A further 30 politicians, businessmen, relatives, figureheads and City Council technicians are implicated. 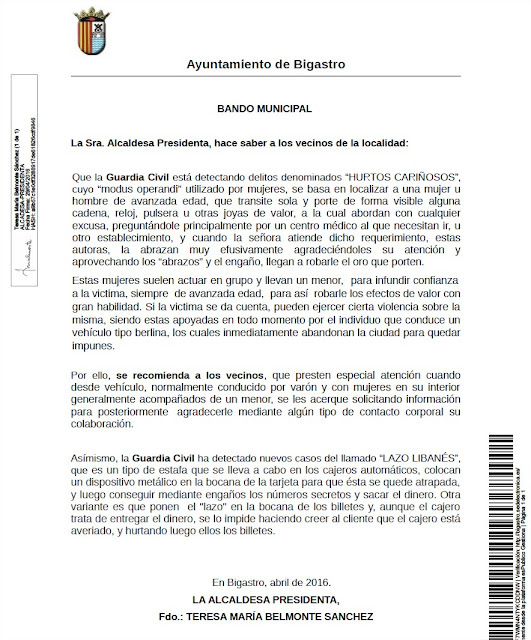 In all there are ten crimes mentioned; conspiracy, bribery, extortion, breach of trust, disclosure of secrets, insider trading, officials prohibited negotiations, fraud, electoral crime and coercion. After such a lengthy investigation, with taped evidence of conversions that took place, you might imagine that this will be an easy one to win. However, experience tells us that is not necessarily going to happen. 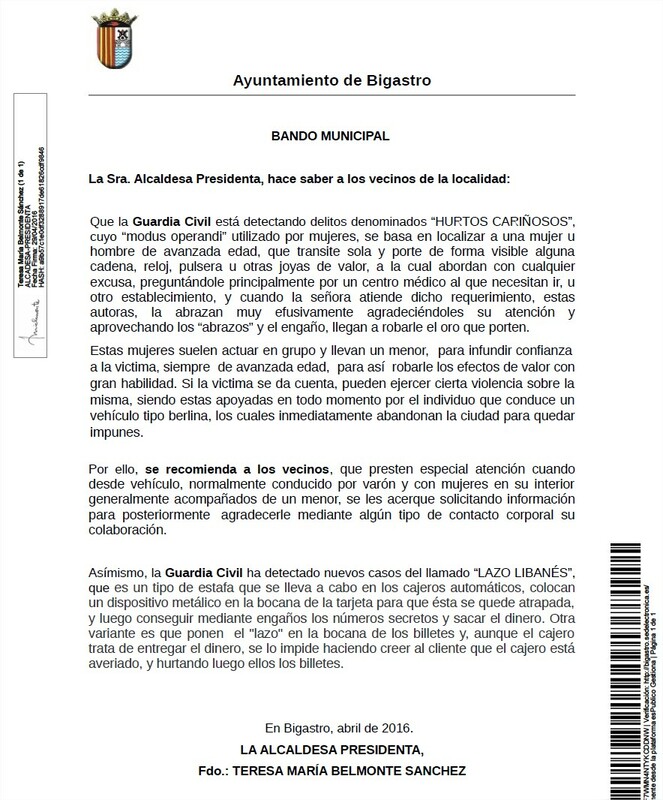 Several cases have been brought against the former mayors of Bigastro and in each one the prosecutor was asking for long custodial sentences. The result though was no more than a ban from holding public office. This information was passed on to me by Scout John and comes from the Courier newspaper. 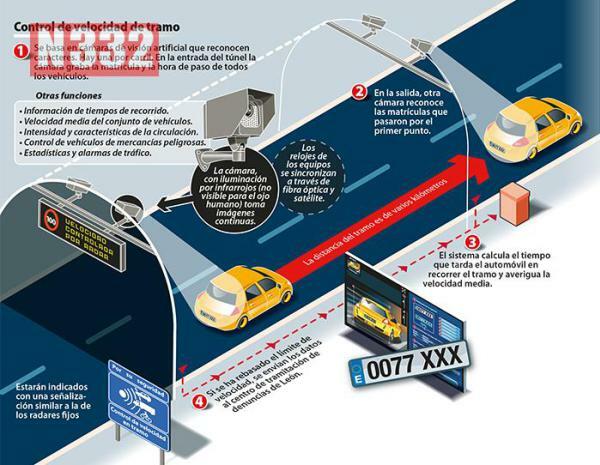 Spain operates a network of traffic monitoring devices, not only looking for drivers who are speeding or those who skip trough red lights, but a new range monitors looks out for such bad practices as using a mobile phone and the use of seatbelts. 1. Fixed Cameras: These devices are nicknamed “speed traps without operators” as they are located along the road network, usually at the side of the road, or sometimes on poles or across the carriageway, and monitor vehicles as they pass, recording those who exceed the maximum permitted limit. 2. 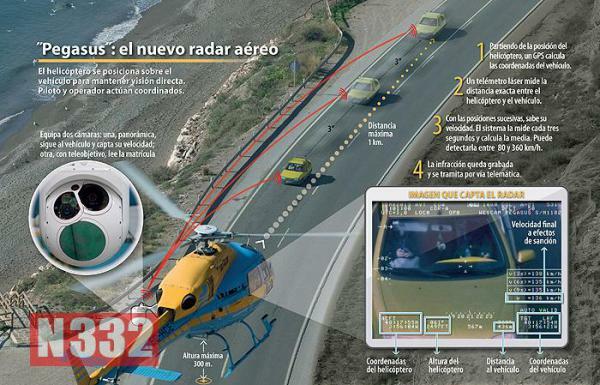 Mobile Radars: These require an operator, or a small team, and are often located in unmarked Guardia Civil vehicles, as well as some in marked cars belonging to traffic law enforcement groups, including the DGT themselves. Depending on the type of equipment, the recording vehicle can either be static or moving. 3. Fixed-Section Radars: These devices operate over a fixed distance of road and monitor the average speed between two points on that section. These devices are often considered to give a more realistic impression of recorded speed as the driver doesn´t usually react instantly when they see one, and so the average reading is a more likely to be the true speed. 4. Red-Light Cameras: This type of equipment does not measure the speed of a vehicle but takes a photograph if the vehicle has failed to stop at a red light. 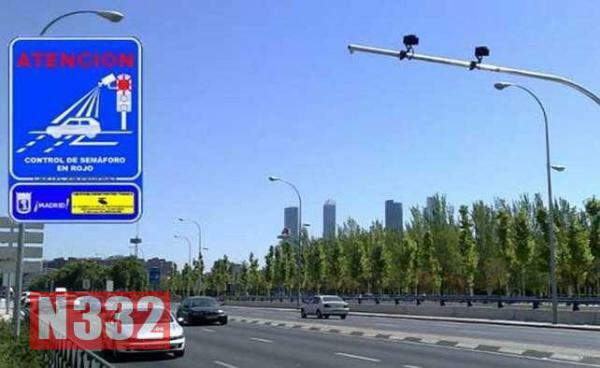 In Madrid alone this year there have been an additional five of these cameras installed with another four due before they become active in June. 5. Pegasus Equipped Helicopters: Pegasus is the name of a recording device fitted to most of the DGT´s traffic helicopters. Distinctive by their yellow and light blue colouring, these “eyes in the sky” can catch offending motorists from a kilometre away and at a height of 300 metres, recording the average speed and vehicle characteristics, as well as monitoring for other traffic violations. Although the article mentions five types of monitoring devices in use, there is also the new type which monitors mobile phone and seatbelt use. The first set of these have only just been installed and will continue to roll out across the road network during 2016 and 2017. There is also a further monitoring device which is sometimes confusing to motorists, as these metal boxes live alongside the road network but have no visible means of taking a picture. 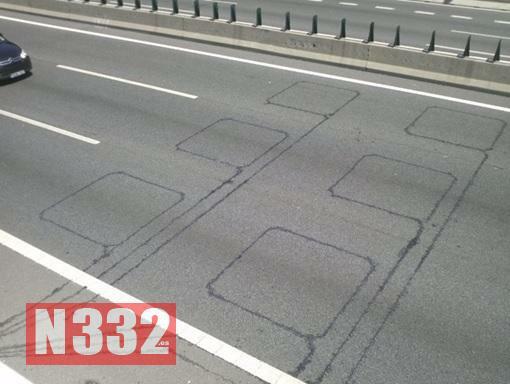 They are identifiable by a square marking in the lane nearby, which is a monitoring sensor, sending information to the roadside box. These devices are used to monitor traffic flow statistics and are not used in enforcement, which is why they have no means of recording individual vehicle details. They are able to record the vehicle type and the number of vehicles using an area, providing essential data to road planners. Having the IPTV box that brings us British TV means that we have stopped watching Canal Plus. 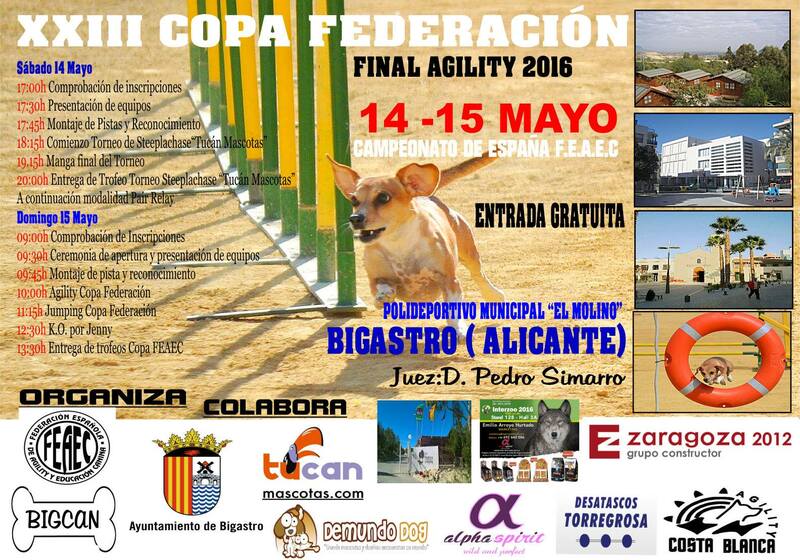 Normally, during May, we look forward to the corridas from Las Ventas that are broadcast on Canal 1. To watch all of the bullfights, you need to pay a subscription but we do get two of the corridas each week free of charge and they are usually the ones with the most famous taurinos. I must check up on the programme menu to see which days we can watch. 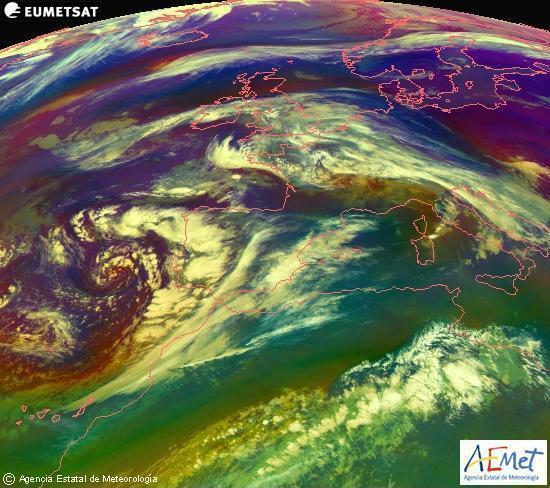 This is the weather system that is covering us with cloud and bringing with it showers. Unfortunately it is moving quite slowly and so will be with us for at least a few days. It should be warm and sunny today but make the most of it because we have some rain coming over the next few days. It is likely to be in the form of short showers rather than prolonged periods of heavy rain. Further inland though, there could well be thunderstorms over the mountains. 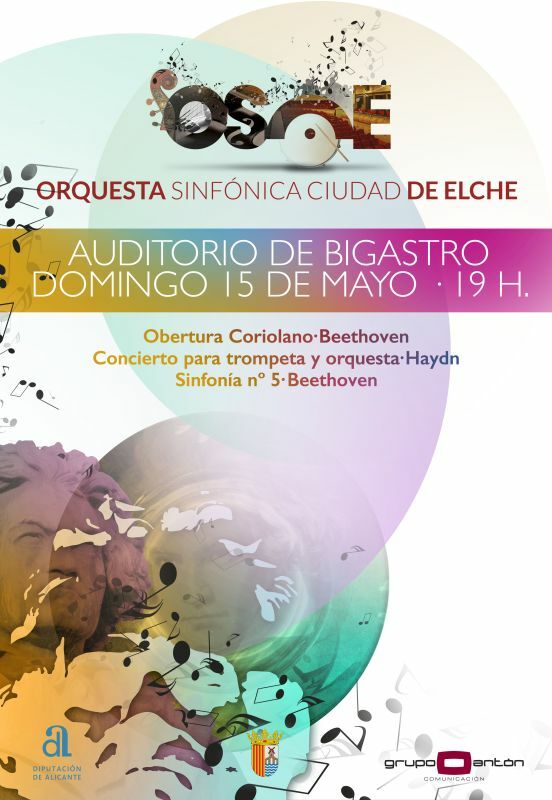 The Symphony Orchestra from Elche will be playing a concert at the Auditorium on Sunday, the 15th May. You can pick up ticket at the Auditorium from Tuesday, 10th May. 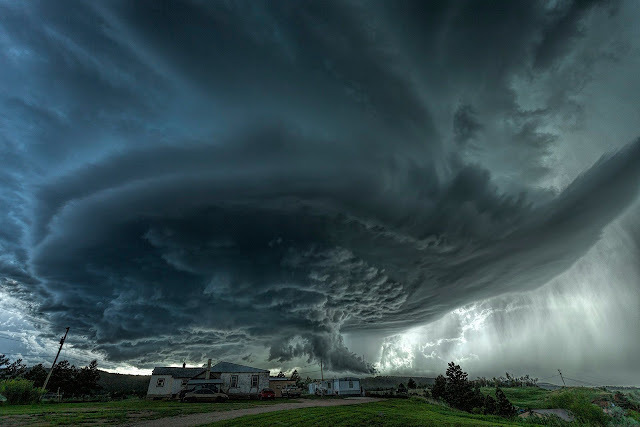 The National Geographic travel photographer of the year competition attracts some of the best photographers in the world to submit entries. This entry for 2016 shows a supercell storm rising over Blackhawk, South Dakota. To be honest, if I was faced with that scene, the last thing I would be thinking of was taking a photo. Hacemos los cucurrones (bolitas del tamaño de un grano de arroz doble) y los dejamos en harina. (coat the beetles with the flour). Cuando estén todos hechos los pasamos por un colador para eliminar la harina que no se haya pegado. (put them in a colander to remove excess flout). Apartamos la olla y echamos el pimentón, lo movemos bien y añadimos el agua. (put the pepper and water in a pan and stir). Cuando hierva echamos las verduras previamente lavadas y troceadas dejándolas hervir una hora aproximadamente. (when the beans are boiling, add the washed vegetables and boil for one hour). Ponemos la sal, el azafrán y la hierbabuena. (now add the salt, saffron and mint). Añadimos los cucurrones y los dejamos cocer de 12 a15 minutos. (finally add the cucurrones and cook for between 12 and 15 minutes). Having read this recipe on Pascual's web site I was curious as to what cururrones were. It is not a word that you will find in every dictionary but still I managed to track it down. Turns out that cucurrones are beetles and were commonly used in recipes from this area in times gone by. So there you have it. If you find yourself with a ready supply of beetles, this is a recipe to cook them. Last year, Leicester City were languishing at the bottom of the English Premier League and so were 5,000 to 1 outsiders to win the Premiership title this season. Actually, many expected them to be relegated this year. These days it is the "big money" clubs that are expected to take the lead but in the case of Leicester, they have spent less on new players in their 132 years of existence than Manchester United spent in the last two years. It is always a joy when the underdog succeeds which makes Leicester's success so sweet. You could say they out foxed them all! Thieves are targeting older people with the intention of robbing them of valuables. The thieves operate as groups of women who aim to distract you and at the same time steal whatever they can. Although we all try to be helpful, when people stop you to ask for directions, they are not always innocent. Watch out for vehicles driven by a young male with young ladies inside and be suspicious. If they stop and ask you for directions to the medical centre, walk away. Whatever you do, do not let them hug you because that is when they will steal your watch, your wallet or whatever else has caught their eye. The notice also warns us of the scam where thieves place a scanner on automatic cash machines to steal your card number or prevent the bank notes from being delivered. Last night's performance by the theatre group, Lugarico, was hilarious. Even if you could not follow all of the dialogue, the action was sufficient to tell the story. It had all the elements of a Whitehall Farce complete with all the comings and goings and the innuendo that genre entails. Take an unfaithful husband with two mistresses, a gay priest and an assortment of others and you have a mix that leaves you laughing in the aisle. Many thanks to Aurelio Murcia who directed the play, the cast and all the other people involved in props, make up etc etc. My album of photos might not make a lot of sense if you missed the performance but it will give you a flavour of the fun. PS After the performance, I was told off by my neighbour Eli Robles (the lady who works in the Town Hall). She and her husband had seen me taking photos of the Mass yesterday morning and could not understand why I didn't stay for the paella later on. I won't make that mistake next year! 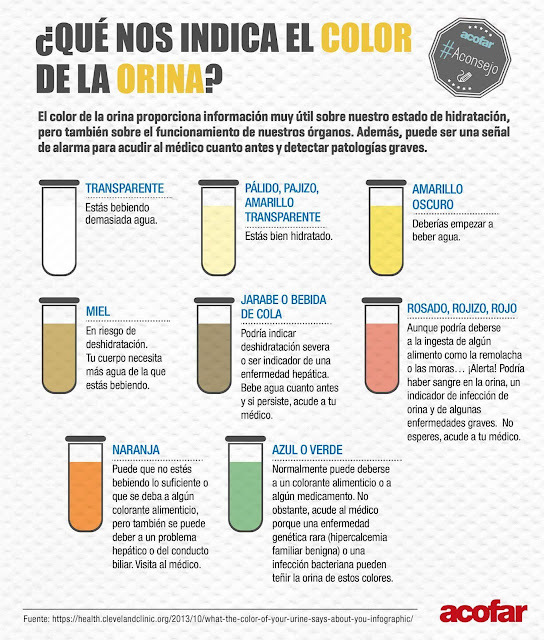 The colour of your pee. 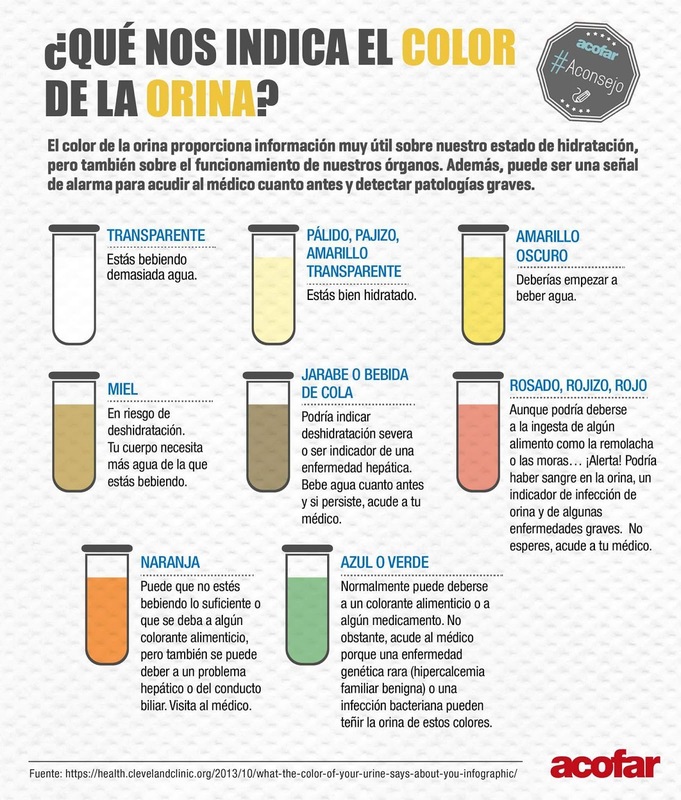 Courtesy of one of the chemist's shops in Bigastro, this chart shows you what the colour of your urine indicates. Mine is often the third colour along which indicates that I don't drink enough water. 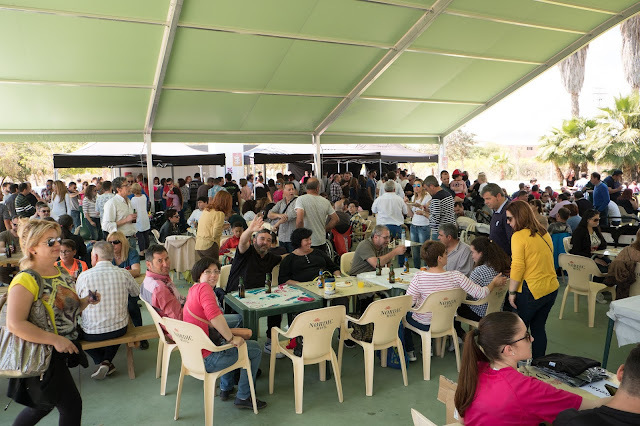 The Alzheimer Association that supports families in Bigastro organised their third Movida Solidaria at the Metro Club just outside of the town. Pam and I went down to sample some of the tapas and see the exhibitions that were scheduled. Sadly, I didn't find the radio controlled model aircraft but we did see the farm tools and bicycles and of course we got to eat some tapas. Great credit has to be given to the helpers who all worked so hard to make the day a huge success. I hope they raised a lot of money for this most worthwhile cause. You can see the pictures I took by going to the album in the left hand sidebar.